It's no wonder love was in the air when actress Emily Blunt and John Krasinski were spotted soaking up the sun in gorgeous Tuscany, one of Italy's most romantic destinations. This first-class resort has attracted a galaxy of stars, including Sting, Naomi Campbell, Keanu Reeves, George Clooney, Madonna and Richard Gere - all for very good reason. Italy's big-name city is the perfect destination to explore if you want a medley of beach, city and countryside on your summer holidays - why choose when you can have all three?! Soak up the alluring art and architecture scene in the resort's picturesque capital of Florence, discover the medieval hill towns and age-old churches in traditional Cortona or lay your towel down at fabulous Forte de Marmi beach - where you'll spot a string of famously owned private villas, stylish beach clubs and boutique designer shops. The Amalfi Coast has made its name as one of Italy's most glamorous A-List destinations, with the pretty village of Positano being a popular spot for celebrity holidays. Dotted with colourful cliff-side houses, chic neighbouring islands and stylish designer towns, this luxury location has welcomed VIP visitors including Gwyneth Paltrow, Olivia Palermo, Poppy Delevingne and more to its Instagram-ready shores. You'll find a cluster of quaint villages nestled within this UNESCO-listed coastline, besides 5 pebble beaches including the main stretch Marina Grande - a fantastic spot for sunbathing, swimming and scuba-diving in the summer. This is certainly the place to be if you like to soak up the scenery, with a variety of boat trips leaving from the harbour each day. Marvel over the luminous green Emerald Grotto in the charming bay of Conca dei Marini, or cruise to the famous isle of Capri - all in a day's work. 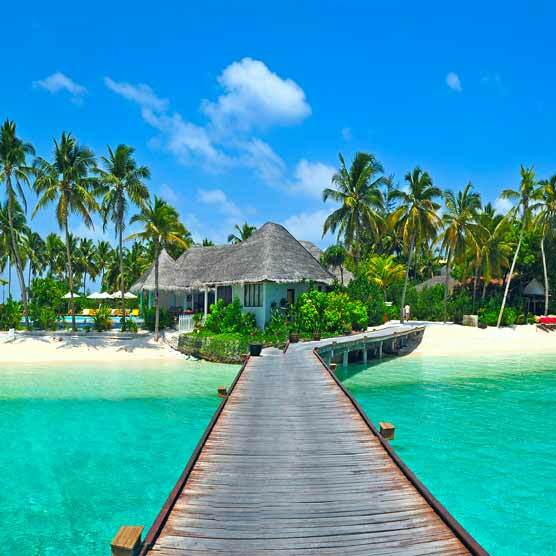 If you're dreaming of ultimate R&R in a destination that's fit for the Royals, then you're in luck, as we've discovered the gorgeous island popular with the likes of Prince William and Kate Middleton - you guessed it, the Maldives. Pretty palms swaying in the Caribbean wind, multi-coloured coral reefs, glistening white beaches and luxurious seafront hotels are what you can expect on this gorgeous island floating in the Indian Ocean. This popular honeymoon destination boasts world-class resorts, excellent food and unforgettable hospitality, making it a hot spot for sunshine holidays with that extra special something. Visit the enchanting capital of Male where you can wander the markets and admire the fishing boats, unwind in a first-class spa or admire the incredible marine life with some of the best scuba diving around. Wish you could click your fingers and wake up on the gorgeous Greek Island of Rhodes? Well, since Harry Potter star Daniel Radcliffe has recently visited the area (and with a little help from our spectacular holiday deals, of course) - you pretty much can! The capital of the Dodacanese Islands serves up an effortless blend of white-sand beaches, ancient towns, lush countryside and fascinating architecture, making it a fabulous destination to visit whether you want a relaxing beach retreat or action-packed culture trip. Visit the ancient cities of Lindos, Ialyssos and Kamiros, boasting beautiful temples, amphitheatres and churches, or spend one of the islands' 300 days of sunshine on the sandy beaches of Faliraki, Saint Paul's Bay, Ladiko and Kallithea. If you’re feeling active, why not climb the steep cobbles from the village of Lindos to the Acropolis, where you'll discover the inner Temple of Athena Lindia, or simply admire the spectacular views of Lindos Bay.